1968. The height of the Vietnam War. Two young men from opposite ends of the earth must drag themselves through Hell for the opportunity to kill one another. 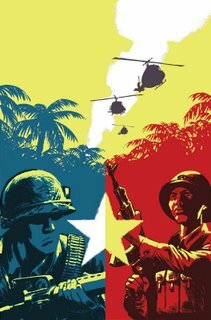 Written by rookie sensation Jason Aaron with astoundingly visceral art by Cameron Stewart (SEAGUY, SEVEN SOLDIERS: GUARDIAN), THE OTHER SIDE is a 5-issue miniseries following Bill Everette, a 19-year-old Alabama farm boy drafted into the Marine Corps whose only goal is to come home alive, and Vo Binh Dai, a 19-year-old Vietnamese farm boy who enlists in the People's Army of Vietnam, terrified only of failing in his duty to die bravely for his country. 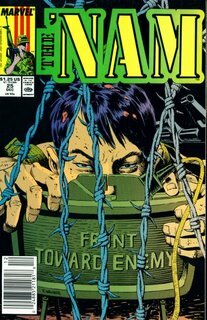 Along the way, Private Everette encounters demonically vicious Parris Island drill instructors, talking maggots, voiceless ghosts, jaded grunts, man-eating pigs, maniacal rats, leeches that quote William Blake, a rifle that begs him to shoot himself and occasionally even the enemy. Vo Dai must undertake the long march south down the Strategic Trail, through black forests and bloody swamps, over pockmarked earth and fields of fire, past tigers and dragons and mounds of the dead, past exhaustion, beyond endurance. At turns, wholly fantastic yet always heartbreakingly realistic. THE OTHER SIDE is an epic tragedy about America's most haunting war. 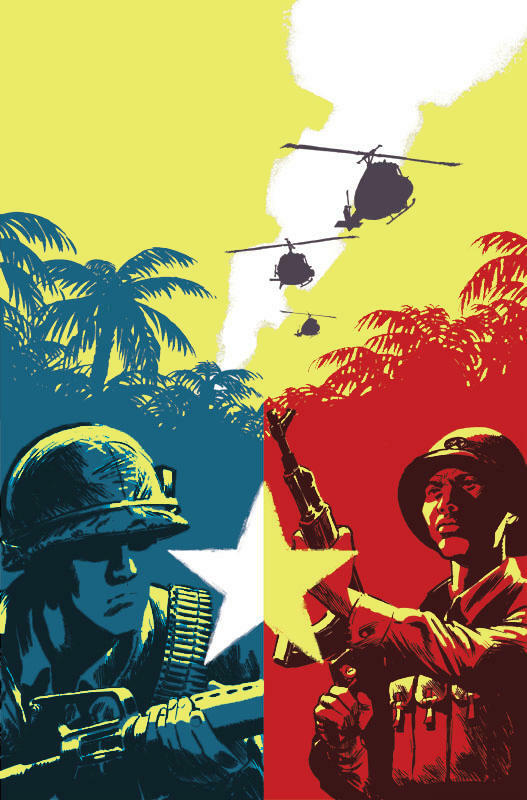 A surreal exploration of the Vietnam war from opposing viewpoints. A horror story about the horrors of war. From your friends in North Korea. This great 'NAM cover is by Ron Wagner. B. Clay Moore asked for it, and here it is: TOD HOLTON, SUPER GREEN BERET. Tod is an all-American teenager who's given a magic, glowing beret by his uncle. When he dons the beret... SHAZAM! Young Tod is transformed into an adult super soldier, much like Captain Marvel in fatigues. 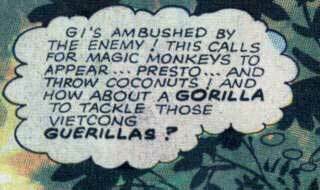 As Super Green Beret, Tod is able to use his magic powers to aid the American troops in Vietnam by making "magic monkeys" appear to throw coconuts at the Viet Cong or turning hand grenades into pineapples. This guy here's already done a great job making fun of this comic, panel by panel, so why should I even try? 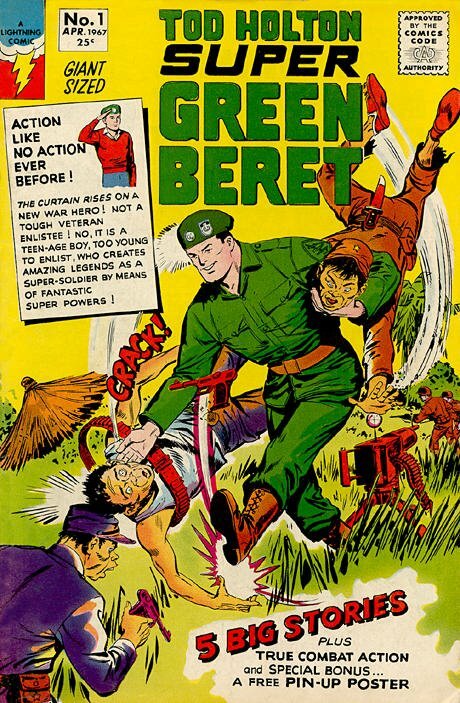 SUPER GREEN BERET, published by Lightning Comics, only lasted for two issues in the spring of 1967. 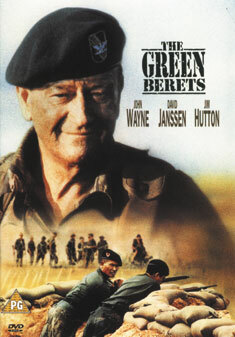 So unfortunately for all the GIs in Vietnam, Super Greenie Beanie was no where to be found come Tet 1968. Probably could've used those magic monkeys of his in Saigon and Hue City.